Ah, my Soul, why so dismayed? Musical families are not uncommon… the Bachs, of course, Gabrielis, Scarlattis, Couperins, Strauss, Mendelssohns and Schumanns. Organist and conductor, Richard Egarr, came across the work of Christopher Gibbons (1615-1676, son of the more famous Orlando, who lived from 1583 to 1625) when reading Pepys some 15 years ago. He realized that the references were too late for Orlando and started playing the work of Christopher – an otherwise almost unknown composer (this is the only CD devoted to his music exclusively) and the first organist appointed at Westminster Abbey after the Reformation in 1660. 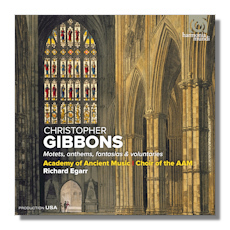 On doing further research, Egarr discovered much more music (particularly anthems, fantasies, fantasy-suites and keyboard music) than the obscurity of Christopher Gibbons would suggest were likely to exist. Working with copies from libraries in Oxford and London, Egarr formed the opinion that he is a composer of "… great personality and genius [who wrote] extraordinary music of great emotional power… [there are] real masterpieces." On the evidence of this excellent release from Harmonia Mundi, Egarr is right. The music here – arranged to alternate styles – is full of surprises, delights, originality, moving melodies, works of stature and of enduring appeal. Listen to the harmonies throughout the instrumental Fantasia [tr.11], for instance beautiful invention laid upon beautiful invention. Variety in tempo, expert use of instruments, telling textures and interest without undue ornateness. Indeed, the release – a selection of 17 works, as exciting as they are varied – opens with a Non nobis that sets the tone. This is music of gentle simplicity yet striking and confident depth. Then the anthem, The Lord said unto my Lord [tr.12] is full of drama and conviction without histrionic or overblown climaxes. The music follows and supports the text. It's almost understated, subdued; a very winning characteristic of Gibbons. Both solo, instrumental (like the "Verse" [tr.13]) and ensemble music with the full AAM choir have a recognizable character, something that soon becomes unmistakably Gibbons' own, as though it were the result of his particular experiences and as though it reflected (musical) priorities which he set himself – but which are now lost. These include an almost restrained, held back, desire to glorify his God; an offering, rather than a foisting, of a wry but solid sense of the beautiful; and a subtle and unostentatious ability to use a superb musicianship to convey these qualities, and more. Egarr and his musicians are clearly responding to this achievement of the under-sung composer with delight. Their playing, though, is neither that of musicians in awe of a new discovery; nor a determination to advocate it at all costs. Rather, the hour or so's music here is a mature exposition of what Gibbons achieved. It is a set of samples, for sure. With apparently so much of his music extant, but unavailable now, that is inevitable. If even a small part of it were of the quality of each of the tracks on this Harmonia Mundi release, we're in for some stunning treats in future. It's almost as though, then, Egarr were presenting this music to us as something already well known, familiar and accepted in the repertoire. Of course it isn't. But the penetration and assuredness with which he offers us what is a surprisingly rich spectrum of sonic rewards suggest a composer who called on a myriad of ideas, techniques, sources and juxtapositions of text, melody, texture and harmony to produce as many musical outcomes. After a couple of listens through the stereo version of this SACD, you begin to wonder why and how Christopher Gibbons hasn't made more of an impact before now. Despite Egarr's wish to play his music in such a way that it seems central to the early English Baroque, the freshness, transparency and clean lines and sounds which it makes are never lost. The acoustic of the recording, in a London church, is close and barely resonant. This has the advantage of letting the music, not its effect or "aura", be what you're aware of and remember. The balance between voices, strings and organs is good: there is plenty of detail, though an ensemble palette almost always results, rather than soloists exposing their skills. Part of these musicians' determination to take the music as music, not as a discovery again. The booklet contains good background, the texts of the five vocal items and brief biographical sketches of the playing (not singing) principals. A major discovery this certainly is. Of increased (musical and historical) interest because of the relationship of Gibbons father to son. But if it were only that, and if the music weren't so startlingly beautiful as it is, the enterprise would be of less enduring value. In fact, Egarr has the vision and ability to arouse and direct the enthusiasm of his fellow players; they too are clearly are enthusiastic – though never roughly so. Nor is their playing or singing in any way unfinished. And this results in a veritable treat of a recital that leave you wanting more. If you have any interest at all in mid-seventeenth century music, of which there is precious little from the British Isles, this is a recording you will want to get immediately. But what Egarr has done is create something of much wider appeal. Recommended.